Last night the eagerly anticipated British Arrow Awards took place at Battersea Evolution and it was a truly special evening for The Mill. Each year the British Arrows Awards brings together the finest in the industry to celebrate the craft and ideas behind the year’s best creative. Hosted by Rob Delaney, the highly coveted arrows were handed out to worthy winners from across the sector, with many of our collaborative partners taking home Gold’s, including Rattling Stick for Audi ‘Duel’, adam&eveDDB for H&M ‘Come Together’, Somesuch and Black Sheep Studios for “HOME”, Don’t Panic and Stink for Save The Children’s ‘Still The Most Shocking Second a Day’ and AMVBBDO for Camelot’s ‘Let’s Not Be Blunt’. The Mill is thrilled to have picked up three awards across Animation, VFX and CGI for Waitrose ‘Coming Home’ working alongside adam&eveDDB, Rogue and Sam Brown. The charming festive spot picked up a Gold arrow in CGI, as well as a Silver in both Animation 3D and VFX. It was also a proud evening for The Mill as Founding Partner and former Chief Creative Officer Pat Joseph received one of the most prestigious and highly respected accolades in the business, as he was handed the Fellowship Award by AMVBBDO CCO and Chairman Paul Brazier. Read Paul's heartfelt letter to Pat here. The Fellowship is a lifetime achievement award in recognition of outstanding achievement. Having co-founded The Mill over twenty-seven years ago alongside CEO Robin Shenfield in a borrowed Soho Square office; Pat has helped build The Mill into the world leading, global content creation studio that it is today. He has not only seen the industry evolve dramatically over the years, but has helped to shape its course for the future, leaving behind an important legacy. The Mill’s Chief Operating Officer Darren O’Kelly comments: “First up I want to thank Pat, with his long-term partner Robin, for starting The Mill. Like so many people before and after me, I remember the first day I walked through the doors of The Mill in Great Marlborough Street. A whipper-snapper from Dublin on my second trip ever to London – I walked past an Oscar and sat on the edge of a sofa in the vast Georgian building. And there, sitting above me, perched like birds of prey, like Simpson and Bruckheimer, like Statler and Waldorf were Joseph and Shenfield. Pat and Robin. This was the beating heart of VFX and little did I know I would get to work incredibly closely with the men who started it all. Little did I know, like so many others, it would change the course of my life. In my first week I got bawled out for leaving a client in reception for too long – great lesson – I’ve dished it out many times since just not with the same devastating sense of disappointment that Pat mastered early. He let us all know that our relationships are the life-blood of The Mill. And so it went on – each year I got to know Pat a little more and each year I would learn a little more. The trust he put in so many people has been extraordinary. Where others doubt he believes. He always backs the people who share the same simple values that he so perfectly espouses. If it were possible to capture what Pat brings to our industry and bottle it then every other company would be as good as The Mill. But it’s not. The special blend of irreverence and ambition, passion and skill, humility and competitiveness and a true vision for what The Mill is and can be are just some of the incongruous ingredients that Pat stands for. Pat instils in all of us; to be the best you can; surround yourself with people who are better than you and challenge your thinking; make great work – its about the work, the work, the work; be honest; love your clients. 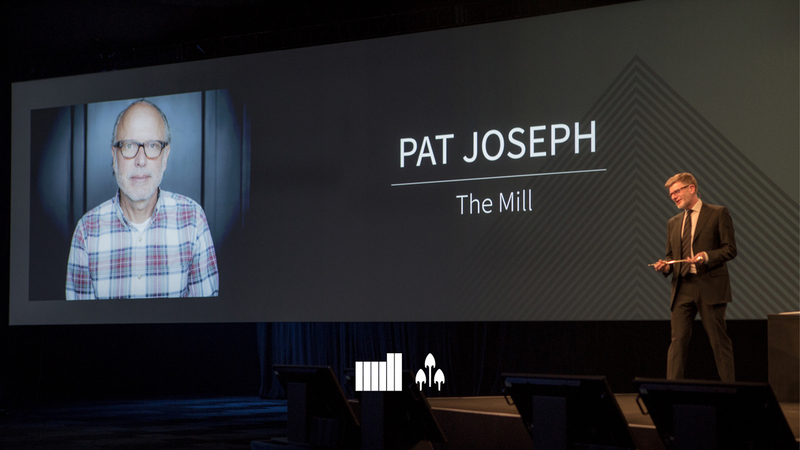 On behalf of everyone at The Mill, I want to thank Pat for believing in the things that truly matter in life and making all of us feel good about ourselves. Everyone is richer for spending time with him – his generosity of time is inspiring – his attention span less so! The most fitting tribute we can pay Pat is to make sure The Mill continues to be bold, inventive and fearless and continues to be a home for idealists and misfits alike who dare to think differently, and who dare to dream. A huge congratulations goes out to Pat and all of the evening’s winners on such a momentous occasion. To view the full list of winners, visit the British Arrows website.